"V-2" redirects here. For other uses, see V2. The V-2 (German: Vergeltungswaffe 2, "Retribution Weapon 2"), technical name Aggregat 4 (A4), was the world's first long-range guided ballistic missile. The missile, powered by a liquid-propellant rocket engine, was developed during the Second World War in Germany as a "vengeance weapon", assigned to attack Allied cities as retaliation for the Allied bombings against German cities. The V-2 rocket also became the first man-made object to travel into space by crossing the Kármán line with the vertical launch of MW 18014 on 20 June 1944. 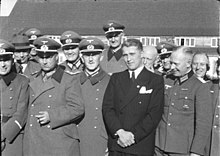 Research into military use of long range rockets began when the studies of graduate student Wernher von Braun attracted the attention of the German Army. A series of prototypes culminated in the A-4, which went to war as the V-2. Beginning in September 1944, over 3,000 V-2s were launched by the German Wehrmacht against Allied targets, first London and later Antwerp and Liège. According to a 2011 BBC documentary, the attacks from V-2s resulted in the deaths of an estimated 9,000 civilians and military personnel, and a further 12,000 forced laborers and concentration camp prisoners died as a result of their forced participation in the production of the weapons. As Germany collapsed, teams from the Allied forces—the United States, the United Kingdom, and the Soviet Union—raced to capture key German manufacturing sites and technology. Wernher von Braun and over 100 key V-2 personnel surrendered to the Americans. Eventually, many of the original V-2 team ended up working at the Redstone Arsenal. The US also captured enough V-2 hardware to build approximately 80 of the missiles. The Soviets gained possession of the V-2 manufacturing facilities after the war, re-established V-2 production, and moved it to the Soviet Union. In the late 1920s, a young Wernher von Braun bought a copy of Hermann Oberth's book, Die Rakete zu den Planetenräumen (The Rocket into Interplanetary Spaces). Starting in 1930, he attended the Technical University of Berlin, where he assisted Oberth in liquid-fueled rocket motor tests. Von Braun was working on his doctorate when the Nazi Party gained power in Germany. An artillery captain, Walter Dornberger, arranged an Ordnance Department research grant for von Braun, who from then on worked next to Dornberger's existing solid-fuel rocket test site at Kummersdorf. Von Braun's thesis, Construction, Theoretical, and Experimental Solution to the Problem of the Liquid Propellant Rocket (dated 16 April 1934), was kept classified by the German Army and was not published until 1960. By the end of 1934, his group had successfully launched two rockets that reached heights of 2.2 and 3.5 km (1.4 and 2.2 mi). At the time, Germany was highly interested in American physicist Robert H. Goddard's research. Before 1939, German engineers and scientists occasionally contacted Goddard directly with technical questions. Von Braun used Goddard's plans from various journals and incorporated them into the building of the Aggregat (A) series of rockets, named for the German word for mechanism or mechanical system. Following successes at Kummersdorf with the first two Aggregate series rockets, Wernher von Braun and Walter Riedel began thinking of a much larger rocket in the summer of 1936, based on a projected 25,000 kg (55,000 lb) thrust engine. By late 1941, the Army Research Center at Peenemünde possessed the technologies essential to the success of the A-4. The four key technologies for the A-4 were large liquid-fuel rocket engines, supersonic aerodynamics, gyroscopic guidance and rudders in jet control. At the time, Adolf Hitler was not particularly impressed by the V-2; he pointed out that it was merely an artillery shell with a longer range and much higher cost. In early September 1943, von Braun promised the Long-Range Bombardment Commission:224 that the A-4 development was "practically complete/concluded,":135 but even by the middle of 1944, a complete A-4 parts list was still unavailable. :224 Hitler was sufficiently impressed by the enthusiasm of its developers, and needed a "wonder weapon" to maintain German morale, so he authorized its deployment in large numbers. The V-2s were constructed at the Mittelwerk site by prisoners from Mittelbau-Dora, a concentration camp where 12,000-20,000 prisoners died during the war. The A-4 used a 74% ethanol/water mixture (B-Stoff) for fuel and liquid oxygen (LOX) (A-Stoff) for oxidizer. At launch the A-4 propelled itself for up to 65 seconds on its own power, and a program motor controlled the pitch to the specified angle at engine shutdown, after which the rocket continued on a ballistic free-fall trajectory. The rocket reached a height of 80 km (50 mi) after shutting off the engine. The fuel and oxidizer pumps were driven by a steam turbine, and the steam was produced by concentrated hydrogen peroxide with sodium permanganate catalyst. Both the alcohol and oxygen tanks were an aluminium-magnesium alloy. The combustion burner reached a temperature of 2,500 to 2,700 °C (4,530 to 4,890 °F). The alcohol-water fuel was pumped along the double wall of the main combustion burner. This regenerative cooling heated the fuel and cooled the combustion chamber. The fuel was then pumped into the main burner chamber through 1,224 nozzles, which assured the correct mixture of alcohol and oxygen at all times. Small holes also permitted some alcohol to escape directly into the combustion chamber, forming a cooled boundary layer that further protected the wall of the chamber, especially at the throat where the chamber was narrowest. The boundary layer alcohol ignited on contact with the atmosphere, accounting for the long, diffuse exhaust plume. By contrast, later, post-V-2 engine designs not employing this alcohol boundary layer cooling show a translucent plume with shock diamonds. The warhead was another source of troubles. The explosive employed was amatol 60/40 detonated by an electric contact fuze. Amatol had the advantage of stability and the warhead was protected by a thick layer of fiberglass, but even so it could still explode in the re-entry phase. The warhead weighed 975 kilograms (2,150 lb) and contained 910 kilograms (2,010 lb) of explosive. The warhead's percentage by weight that was explosive was 93%, a very high percentage when compared with other types of munition. The protective layer was used for the fuel tanks as well and the A-4 did not have the tendency to form ice, which was common to other early missiles (like the balloon tank-design SM-65 Atlas). The tanks held 4,173 kilograms (9,200 lb) of ethyl alcohol and 5,553 kilograms (12,242 lb) of oxygen. Captured V-2 on public display in Antwerp, 1945. Exhaust vanes and external rudders in tail section shown. The V-2 was guided by four external rudders on the tail fins, and four internal graphite vanes in the jet stream at the exit of the motor. The LEV-3 guidance system consisted of two free gyroscopes (a horizontal and a vertical) for lateral stabilization, and a PIGA accelerometer to control engine cutoff at a specified velocity. The V-2 was launched from a pre-surveyed location, so the distance and azimuth to the target were known. Fin 1 of the missile was aligned to the target azimuth. Some later V-2s used "guide beams", radio signals transmitted from the ground, to keep the missile on course, but the first models used a simple analog computer that adjusted the azimuth for the rocket, and the flying distance was controlled by the timing of the engine cut-off, "Brennschluss", ground controlled by a Doppler system or by different types of on-board integrating accelerometers. The rocket stopped accelerating and soon reached the top of the approximately parabolic flight curve. The painting of the operational V-2s was mostly a ragged-edged pattern with several variations, but at the end of the war a plain olive green rocket also appeared. During tests, the rocket was painted in a characteristic black-and-white chessboard pattern, which aided in determining if the rocket was spinning around its longitudinal axis. The original German designation of the rocket was "V2", unhyphenated — exactly as used for any Third Reich-era "second prototype" example of an RLM-registered German aircraft design — but U.S. publications such as Life magazine were using the hyphenated form "V-2" as early as December 1944. This hyphenated form has now become common usage. For a description of a test explosion, see Test Stand VII. A sectioned V-2 engine on display at the Deutsches Museum, Munich (2006). 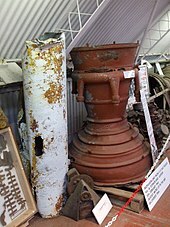 Two test launches were recovered by the Allies: the Bäckebo rocket, the remnants of which landed in Sweden on 13 June 1944 and one recovered by the Polish resistance on 30 May 1944 from Blizna and transported to the UK during Operation Most III. The highest altitude reached during the war was 174.6 kilometres (108.5 miles) (20 June 1944). 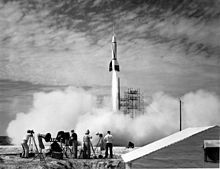 Test launches of V-2 rockets were made at Peenemünde, Blizna and Tuchola Forest, and after the war, at Cuxhaven by the British, White Sands Proving Grounds and Cape Canaveral by the U.S., and Kapustin Yar by the USSR. On 22 December 1942, Hitler signed the order for mass production, when Speer assumed final technical data would be ready by July 1943. However, many issues still remained to be solved even by the autumn of 1943. A production line was nearly ready at Peenemünde when the Operation Hydra attack caused the Germans to move production to the underground Mittelwerk in the Kohnstein where 5,200 V-2 rockets were built with the use of forced labour. For a description of the V-2 launch equipment and procedure, see Meillerwagen. Following Operation Crossbow bombing, initial plans for launching from the massive underground Watten and Wizernes bunkers or from fixed pads such as near the Château du Molay were dropped in favour of mobile launching. Eight main storage dumps were planned and four had been completed by July 1944 (the one at Mery-sur-Oise was begun in August 1943 and completed by February 1944). The missile could be launched practically anywhere, roads running through forests being a particular favourite. The system was so mobile and small that only one Meillerwagen was ever caught in action by Allied aircraft, during the Operation Bodenplatte attack on 1 January 1945 near Lochem by a USAAF 4th Fighter Group aircraft, although Raymond Baxter described flying over a site during a launch and his wingman firing at the missile without hitting it. It was estimated that a sustained rate of 350 V-2s could be launched per week, with 100 per day at maximum effort, given sufficient supply of the rockets. 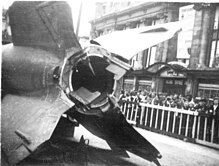 One of the victims of a V-2 that struck Teniers Square, Antwerp, Belgium on 27 November 1944. 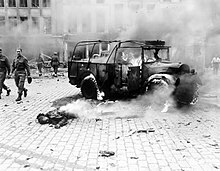 A British military convoy was passing through the square at the time; 126 (including 26 Allied soldiers) were killed. The LXV Armeekorps z.b.V. formed during the last days of November 1943 in France commanded by General der Artillerie z.V. Erich Heinemann was responsible for the operational use of V-2. The British government initially attempted to conceal the cause of the explosions by blaming them on defective gas mains. The public therefore began referring to the V-2s as "flying gas pipes". The Germans themselves finally announced the V-2 on 8 November 1944 and only then, on 10 November 1944, did Winston Churchill inform Parliament, and the world, that England had been under rocket attack "for the last few weeks". In September 1944 control of the V-2 mission was taken over by the Waffen-SS. Positions of the German launch units changed a number of times. For example, Artillerie Init 444 arrived in the southwest Netherlands (in Zeeland) in September 1944. 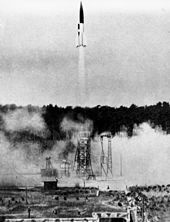 From a field near the village of Serooskerke, five V-2s were launched on 15 and 16 September, with one more successful and one failed launch on the 18th. That same date, a transport carrying a missile took a wrong turn and ended up in Serooskerke itself, giving a villager the opportunity to surreptitiously take some photographs of the weapon; these were smuggled to London by the Dutch Resistance. After that the unit moved to the woods near Rijs, Gaasterland in the northwest Netherlands, to ensure that the technology did not fall into Allied hands. From Gaasterland V-2s were launched against Ipswich and Norwich from 25 September (London being out of range). Because of their inaccuracy, these V-2s did not hit their target cities. Shortly after that only London and Antwerp remained as designated targets as ordered by Adolf Hitler himself, Antwerp being targeted in the period of 12 to 20 October, after which time the unit moved to The Hague. 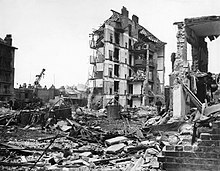 Ruined buildings at Whitechapel, London, left by the penultimate V-2 to strike the city on 27 March 1945; the rocket killed 134 people. The final V-2 to fall on London killed one person at Orpington later the same day. An estimated 2,754 civilians were killed in London by V-2 attacks with another 6,523 injured, which is two people killed per V-2 rocket. However, this understates the potential of the V-2, since many rockets were misdirected and exploded harmlessly. Accuracy increased over the course of the war, particularly for batteries where the Leitstrahl (radio guide beam) system was used. Missile strikes that found targets could cause large numbers of deaths — 160 were killed and 108 seriously injured in one explosion at 12:26 pm on 25 November 1944, at a Woolworth's department store in New Cross, south-east London. British intelligence sent false reports via their Double-Cross System implying that the rockets were over-shooting their London target by 10 to 20 miles (16 to 32 km). This tactic worked; more than half of the V-2s aimed at London landed outside the London Civil Defense Region.:p. 459 Most landed on less-heavily populated areas in Kent due to erroneous recalibration. For the remainder of the war, British intelligence kept up the ruse by repeatedly sending bogus reports implying that the rockets were now striking the British capital with heavy loss of life. Antwerp, Belgium was also the target for a large number of V-weapon attacks from October 1944 through March 1945, leaving 1,736 dead and 4,500 injured in greater Antwerp. Thousands of buildings were damaged or destroyed as the city was struck by 590 direct hits. The largest loss of life in a single attack came on 16 December 1944, when the roof of the crowded cinema REX was struck, leaving 567 dead and 291 injured. At least one V-2 missile on a mobile Meillerwagen launch trailer was observed being elevated to launch position by a USAAF 4th Fighter Group pilot defending against the massive New Year's Day 1945 Operation Bodenplatte strike by the Luftwaffe over the northern German attack route near the town of Lochem on 1 January 1945. Possibly, from the potential sighting of the American fighter by the missile's launch crew, the rocket was quickly lowered from a near launch-ready 85° elevation to 30°. After the US Army captured the Ludendorff Bridge during the Battle of Remagen, the Germans were desperate to destroy it. On 17 March 1945, they fired eleven V-2 missiles at the bridge, their first use against a tactical target. They could not employ the more accurate Leitstrahl device because it was oriented towards Antwerp and could not be easily adjusted for another target. Fired from near Hellendoorn, the Netherlands, one of the missiles landed as far away as Cologne, 40 miles (64 km) to the north, while one missed the bridge by only 500 to 800 yards (460 to 730 m). They also struck the town of Remagen, destroying a number of buildings and killing at least six American soldiers. The final two rockets exploded on 27 March 1945. One of these was the last V-2 to kill a British civilian: Mrs. Ivy Millichamp, aged 34, killed in her home in Kynaston Road, Orpington in Kent. After the Nazi defeat, German engineers were moved to the United States, the United Kingdom and the USSR, where they further developed the V-2 rocket for military and civilian purposes. The V-2 rocket also laid the foundation for the liquid fuel missiles and space launchers used later. Unlike the V-1, the V-2's speed and trajectory made it practically invulnerable to anti-aircraft guns and fighters, as it dropped from an altitude of 100–110 km (62–68 mi) at up to three times the speed of sound at sea level (approximately 3550 km/h). Nevertheless, the threat of what was then code-named "Big Ben" was great enough that efforts were made to seek countermeasures. The situation was similar to the pre-war concerns about manned bombers and led to a similar solution, the formation of the Crossbow Committee to collect, examine and develop countermeasures. Early on, it was believed that the V-2 employed some form of radio guidance, a belief that persisted in spite of several rockets being examined without discovering anything like a radio receiver. This led to efforts to jam this non-existent guidance system as early as September 1944, using both ground and air-based jammers flying over the UK. In October, a group had been sent to jam the missiles during launch. By December it was clear these systems were having no obvious effect, and jamming efforts ended. General Frederick Alfred Pile, commander of Anti-Aircraft Command, studied the problem and proposed that enough anti-aircraft guns were available to produce a barrage of fire in the rocket's path, but only if provided with a reasonable prediction of the trajectory. The first estimates suggested that 320,000 shells would have to be fired for each rocket. About 2% of these were expected to fall back to the ground, almost 90 tons of rounds, which would cause far more damage than the missile. At a 25 August 1944 meeting of the Crossbow Committee, the concept was rejected. Pile continued studying the problem, and returned with a proposal to fire only 150 shells at a single rocket, with those shells using a new fuse that would greatly reduce the number that fell back to Earth unexploded. Some low-level analysis suggested that this would be successful against 1 in 50 rockets, provided that accurate trajectories were forwarded to the gunners in time. Work on this basic concept continued and developed into a plan to deploy a large number of guns in Hyde Park that were provided with pre-configured firing data for 2.5-mile (4.0-kilometre) grids of the London area. After the trajectory was determined, the guns would aim and fire between 60 and 500 rounds. At a Crossbow meeting on 15 January 1945 Pile's updated plan was presented with some strong advocacy from Roderic Hill and Charles Drummond Ellis. However, the Committee suggested that a test not be carried out as no technique for tracking the missiles with sufficient accuracy had yet been developed. By March this had changed significantly, with 81% of incoming missiles correctly allotted to the grid square each fell into, or the one beside it. At a 26 March meeting the plan moved ahead, and Pile was directed to a subcommittee with RV Jones and Ellis to further develop the statistics. Three days later the team returned a report stating that if the guns fired 2,000 rounds at a missile there was a 1 in 60 chance of shooting it down. Plans for an operational test began, but as Pile later put it, "Monty beat us to it", as the attacks ended with the Allied liberation of their launching areas. With the Germans no longer in control of any part of the continent that could be used as a launching site capable of striking London, they turned their attention on Antwerp. Plans were made to move the Pile system to protect that city, but the war ended before anything could be done. Another defence against the V-2 campaign was to destroy the launch infrastructure—expensive in terms of bomber resources and casualties—or to cause the Germans to aim at the wrong place through disinformation. The British were able to convince the Germans to direct V-1s and V-2s aimed at London to less populated areas east of the city. This was done by sending deceptive reports on the damage caused and sites hit via the German espionage network in Britain, which was controlled by the British (the Double-Cross System). According to the BBC television presenter Raymond Baxter, who served with the RAF during the war, in February 1945 his squadron was carrying out a mission against a V2 launch site, when one missile was launched in front of them. One member of Baxter's squadron opened fire on it, without effect. 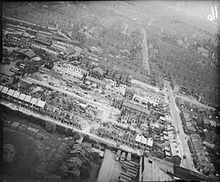 On 3 March 1945 the Allies attempted to destroy V-2s and launching equipment in the "Haagse Bos" in The Hague by a large-scale bombardment, but due to navigational errors the Bezuidenhout quarter was destroyed, killing 511 Dutch civilians. Churchill sent a scathing minute to General Ismay requesting a thorough explanation for "this extraordinarily bad aiming". The German V-weapons (V-1 and V-2) cost the equivalent of around USD $40 billion (2015 dollars), which was 50 percent more than the Manhattan Project that produced the atomic bomb. :178 6,048 V-2s were built, at a cost of approximately 100,000 Reichsmark (GB£2,370,000 (2011)) each; 3,225 were launched. SS General Hans Kammler, who as an engineer had constructed several concentration camps including Auschwitz, had a reputation for brutality and had originated the idea of using concentration camp prisoners as slave laborers in the rocket program. More people died manufacturing the V-2 than were killed by its deployment. The V-2 consumed a third of Germany's fuel alcohol production and major portions of other critical technologies: to distil the fuel alcohol for one V-2 launch required 30 tonnes of potatoes at a time when food was becoming scarce. Due to a lack of explosives, some warheads were simply filled in with concrete, using the kinetic energy alone for destruction, and sometimes the warhead contained photographic propaganda of German citizens who had died in Allied bombings. The psychological effect of the V-2 was considerable, as the V-2, travelling faster than the speed of sound, gave no warning before impact (unlike bombing planes or the V-1 Flying Bomb, which made a characteristic buzzing sound). There was no effective defence and no risk of pilot and crew casualties. With the war all but lost, regardless of the factory output of conventional weapons, the Nazis resorted to V-weapons as a tenuous last hope to influence the war militarily (hence Antwerp as V-2 target), as an extension of their desire to "punish" their foes and most importantly to give hope to their supporters with their miracle weapon. The V-2 had no effect on the outcome of the war, but it led to the ICBMs of the Cold War that were used for space exploration. A submarine-towed launch platform was tested successfully, making it the prototype for submarine-launched ballistic missiles. The project codename was Prüfstand XII ("Test stand XII"), sometimes called the rocket U-boat. If deployed, it would have allowed a U-boat to launch V-2 missiles against United States cities, though only with considerable effort (and limited effect). Hitler, in July 1944 and Speer, in January 1945, made speeches alluding to the scheme, though Germany did not possess the capability to fulfill these threats. These schemes were met by the Americans with Operation Teardrop. While interned after the war by the British at CSDIC camp 11, Dornberger was recorded saying that he had begged the Führer to stop the V-weapon propaganda, because nothing more could be expected from one ton of explosive. To this Hitler had replied that Dornberger might not expect more, but he (Hitler) certainly did. According to decrypted messages from the Japanese embassy in Germany, twelve dismantled V-2 rockets were shipped to Japan. These left Bordeaux in August 1944 on the transport U-boats U-219 and U-195, which reached Djakarta in December 1944. A civilian V-2 expert was a passenger on U-234, bound for Japan in May 1945 when the war ended in Europe. The fate of these V-2 rockets is unknown. At the end of the war, a race began between the United States and the USSR to retrieve as many V-2 rockets and staff as possible. Three hundred rail-car loads of V-2s and parts were captured and shipped to the United States and 126 of the principal designers, including Wernher von Braun and Walter Dornberger, were in American hands. Von Braun, his brother Magnus von Braun, and seven others decided to surrender to the United States military (Operation Paperclip) to ensure they were not captured by the advancing Soviets or shot dead by the Nazis to prevent their capture. Operation Backfire V-2 rocket on Meillerwagen (S.I. Negative #76-2755). In October 1945, British Operation Backfire assembled a small number of V-2 missiles and launched three of them from a site in northern Germany. The engineers involved had already agreed to move to the US when the test firings were complete. The Backfire report remains the most extensive technical documentation of the rocket, including all support procedures, tailored vehicles and fuel composition. In 1946, the British Interplanetary Society proposed an enlarged man-carrying version of the V-2, called Megaroc. It could have enabled sub-orbital spaceflight similar to, but at least a decade earlier than, the Mercury-Redstone flights of 1961. Operation Paperclip recruited German engineers and Special Mission V-2 transported the captured V-2 parts to the United States. At the close of the Second World War, over 300 rail cars filled with V-2 engines, fuselages, propellant tanks, gyroscopes, and associated equipment were brought to the railyards in Las Cruces, New Mexico, so they could be placed on trucks and driven to the White Sands Proving Grounds, also in New Mexico. In addition to V-2 hardware, the U.S. Government delivered German mechanization equations for the V-2 guidance, navigation, and control systems, as well as for advanced development concept vehicles, to U.S. defence contractors for analysis. In the 1950s some of these documents were useful to U.S. contractors in developing direction cosine matrix transformations and other inertial navigation architecture concepts that were applied to early U.S. programs such as the Atlas and Minuteman guidance systems as well as the Navy's Subs Inertial Navigation System. A committee was formed with military and civilian scientists to review payload proposals for the reassembled V-2 rockets. This led to an eclectic array of experiments that flew on V-2s and paved the way for American manned space exploration. Devices were sent aloft to sample the air at all levels to determine atmospheric pressures and to see what gases were present. Other instruments measured the level of cosmic radiation. 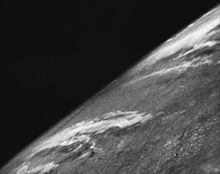 The first photo from space was taken from a V-2 launched by US scientists on 24 October 1946. Only 68 percent of the V-2 trials were considered successful. A supposed V-2 launched on 29 May 1947 landed near Juarez, Mexico and was actually a Hermes B-1 vehicle. The U.S. Navy attempted to launch a German V-2 rocket at sea—one test launch from the aircraft carrier USS Midway was performed on 6 September 1947 as part of the Navy's Operation Sandy. The test launch was a partial success; the V-2 went off the pad but splashed down in the ocean only some 10 km (6 mi) from the carrier. The launch setup on the Midway's deck is notable in that it used foldaway arms to prevent the missile from falling over. The arms pulled away just after the engine ignited, releasing the missile. The setup may look similar to the R-7 launch procedure but in the case of the R-7 the trusses hold the full weight of the rocket, rather than just reacting to side forces. The PGM-11 Redstone rocket is a direct descendant of the V-2. The USSR also captured a number of V-2s and staff, letting them stay in Germany for a time. The first work contracts were signed in the middle of 1945. In 1946 (as part of Operation Osoaviakhim) they were obliged to move to Kapustin Yar in the USSR, where Helmut Gröttrup headed up a group of just under 250 engineers. The first Soviet missile was the R-1, a duplicate of the V-2. Most of the German team was sent home after that project but some remained to do research until as late as 1951. Unknown to the Germans, work immediately began on larger missiles, the R-2 and R-5, based on extension of the V-2 technology. In the autumn of 1945, the group led by M. Tikhonravov K. and N. G. Chernyshov at NII-4 rocket artillery institute of the USSR Academy of Sciences developed on their own initiative the first stratospheric rocket project. BP-190 called for vertical flight of two pilots to an altitude of 200 km using captured German V-2 rockets. A rusty V-2 engine in the original underground production facilities at the Dora-Mittelbau concentration camp memorial site. V-2 on display in Musée de l'Armée, Paris. At least 20 V-2s still existed in 2014. One at the Australian War Memorial, Canberra, including complete Meillerwagen transporter. The rocket has the most complete set of guidance components of all surviving A4s. The Meillerwagen is the most complete of the three examples known to exist. Another A4 was on display at the RAAF Museum at Point Cook outside Melbourne. Both rockets now reside in Canberra. One example, partly skeletonized, is in the collection of the Royal Netherlands Army Museum. In this collection are also a launching table and some loose parts, as well as the remains of a V-2 that crashed in The Hague immediately after launch. A reconstruction of a V-2 missile containing multiple original recovered parts is on display at the Armia Krajowa Museum in Kraków. One engine at Cité de l'espace in Toulouse. V-2 display including engine, parts, rocket body and many documents and photographs relating to the development and use at La Coupole museum, Wizernes, Pas de Calais. One complete rocket in WWII wing of the Musée de l'Armée (Army Museum) in Paris. One complete missile and an additional engine at the Deutsches Museum in Munich. One engine at the German Museum of Technology in Berlin. One engine at the Deutsches Historisches Museum in Berlin. One rusty engine in the original V-2 underground production facilities at the Dora-Mittelbau concentration camp memorial site. One replica was constructed for the Historical and Technical Information Centre in Peenemünde, where it is displayed near what remains of the factory where it was built. One at the Science Museum, London. One, on loan from Cranfield University, at the Imperial War Museum, London. 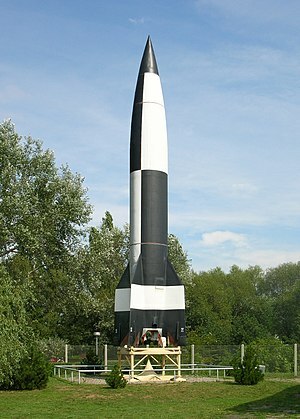 The RAF Museum has two rockets, one of which is displayed at its Cosford site. The Museum also owns a Meillerwagen, a Vidalwagen, a Strabo crane, and a firing table with towing dolly. One at the Royal Engineers Museum in Chatham, Kent. A complete turbo-pump is at Solway Aviation Museum, Carlisle Airport as part of the Blue Streak Rocket exhibition. The venturi segment of one discovered in April 2012 was donated to the Harwich Sailing Club after they found it buried in a mudflat. A gyroscope unit is on display at the National Space Centre in Leicester. A turbo pump unit on display at the National Space Centre in Leicester. A steam generating chamber on display at the National Space Centre in Leicester. One at the National Museum of the United States Air Force, including complete Meillerwagen, Dayton, Ohio. One (chessboard-painted) at the Cosmosphere in Hutchinson, Kansas. One at the National Air and Space Museum, Washington, D.C.
One at the Fort Bliss Air Defense Museum, El Paso, Texas. One (yellow and black) at Missile Park, White Sands Missile Range in White Sands, New Mexico. One at Marshall Space Flight Center in Huntsville, Alabama. One at the U.S. Space & Rocket Center in Huntsville, Alabama. One engine at the Stafford Air & Space Museum in Weatherford, Oklahoma. One engine at the U.S. Space & Rocket Center in Huntsville, Alabama. Two engines at the National Museum of the United States Air Force (one was transferred from United States Army Ordnance Museum in Aberdeen, Maryland around 2005 when the museum closed). Combustion chambers and other components plus a U.S. built engine at the Steven F. Udvar-Hazy Center in Dulles, Virginia. One engine at the Museum of Science and Industry in Chicago. One rocket body at Picatinny Arsenal in Dover, NJ. One engine in the Exhibit Hall adjacent to the Blockhouse building on the Historic Cape Canaveral Tour in Cape Canaveral, Florida. ^ a b Kennedy, Gregory P. (1983). Vengeance Weapon 2: The V-2 Guided Missile. Washington DC: Smithsonian Institution Press. pp. 27, 74. ^ a b c d e f g h i Neufeld, Michael J (1995). The Rocket and the Reich: Peenemünde and the Coming of the Ballistic Missile Era. New York: The Free Press. pp. 73, 74, 101, 281. ^ Syed Ramsey (2016). Tools of War: History of Weapons in Modern Times. Vij Books India Pvt Ltd. p. 89. ISBN 978-93-86019-83-7. ^ a b Wernher von Braun#Early life. ^ a b c d e Wernher von Braun#The Prussian rocketeer and working under the Nazis. ^ Christopher, John. The Race for Hitler's X-Planes (The Mill, Gloucestershire: History Press, 2013), p.110. ^ a b c d e f Ordway, Frederick I, III; Sharpe, Mitchell R. Godwin, Robert (ed.). The Rocket Team. Apogee Books Space Series 36. p. 32. ISBN 1-894959-00-0. ^ a b c d e f g h i j Dornberger, Walter (1952). V-2. New York: Viking. English translation 1954. ^ a b c d e f g h Irving, David (1964). The Mare's Nest. London: William Kimber and Co. p. 17. ^ a b Middlebrook, Martin (1982). The Peenemünde Raid: The Night of 17–18 August 1943. New York: Bobs-Merrill. p. 19. ^ a b Christopher, p.111. ^ Braun, Wernher von (Estate of); Ordway III, Frederick I (1985) . Space Travel: A History. New York: Harper & Row. p. 45. ISBN 0-06-181898-4. ^ a b c Irons, Roy. "Hitler's terror weapons: The price of vengeance": 181. ^ Hakim, Joy (1995). A History of Us: War, Peace and all that Jazz. New York: Oxford University Press. pp. 100–104. ISBN 0-19-509514-6. ^ Hunt, Linda (1991). Secret Agenda: The United States Government, Nazi Scientists, and Project Paperclip, 1945 to 1990. New York: St.Martin's Press. pp. 72–74. ISBN 0-312-05510-2. ^ Béon, Yves (1997). Planet Dora: A Memoir of the Holocaust and the Birth of the Space Age. translated from the French La planète Dora by Béon & Richard L. Fague. Westview Press, Div. of Harper Collins. pp. (SC) page tbd. ISBN 0-8133-3272-9. ^ "Dora and the V–2". uah.edu. Archived from the original on 29 June 2014. ^ Dungan, T. "The A4-V2 Rocket Site". Archived from the original on 31 May 2011. Retrieved 2 June 2011. ^ a b c Pocock, Rowland F (1967). German Guided Missiles of the Second World War. New York: Arco Publishing Company, Inc. pp. 51, 52. ^ a b c d Klee, Ernst; Merk, Otto (1965) . The Birth of the Missile:The Secrets of Peenemünde. Hamburg: Gerhard Stalling Verlag. p. 47. ^ Inc, Time (25 December 1944). "V-2: Nazi Rocket Details Are Finally Revealed". LIFE. 17 (26): 46–48. ^ a b Johnson, David (1982). V-1, V-2: Hitler's Vengeance on London. New York: Stein and Day. p. 100. ISBN 9780812828580. ^ Speer, Albert (1995). Inside the Third Reich. London: Weidenfeld & Nicolson. pp. 496–497. ISBN 9781842127353. ^ Ruggles, Richard; Brodie, Henry (1947). "An Empirical Approach to Economic Intelligence in World War II". Journal of the American Statistical Association. 42 (237): 72–91. doi:10.2307/2280189. JSTOR 2280189. ^ Jones, R. V. (1978). Most Secret War: British Scientific Intelligence 1939–1945. London: Hamish Hamilton. p. 433. ISBN 0-241-89746-7. ^ "V-Weapons Crossbow Campaign". Allworldwars.com. Archived from the original on 4 February 2009. Retrieved 27 April 2010. ^ Ordway, Frederick I, III; Sharpe, Mitchell R (1979). The Rocket Team. Apogee Books Space Series 36. New York: Thomas Y. Crowell. p. 256. ISBN 1-894959-00-0. Archived from the original (index) on 4 March 2012. ^ Walker, John (27 September 1993). "A Rocket a Day Keeps the High Costs Away". Archived from the original on 3 November 2008. Retrieved 14 November 2008. ^ "Antwerp, "City of Sudden Death"". www.v2rocket.com. Archived from the original on 3 July 2015. Retrieved 31 July 2015. ^ Ramsey, Syed (12 May 2016). Tools of War: History of Weapons in Modern Times. Vij Books India Pvt Ltd. p. 96. ISBN 978-93-86019-83-7. ^ Winston Churchill, Prime Minister (10 November 1944). "German Long-Range Rockets". Parliamentary Debates (Hansard). Commons. col. 1653-4. Archived from the original on 20 April 2014. ^ and Division z.V LXV Armeekorps z.b.V. ^ van Dijk, A.H.; Eekman, P.G. ; Roelse, J.; Tuynman, J. (1984). Walcheren onder vuur en water 1939–1945 (in Dutch). Middelburg: Den Boer Middelburg/Uitgevers. p. 98. ISBN 90 70027 82 8. ^ Bisbach, Emily. "The last V2 on London". West End at War. Archived from the original on 4 February 2016. Retrieved 31 July 2015. ^ "V2 Rocket Facts". World War 2 Facts. Archived from the original on 15 December 2013. Retrieved 14 December 2013. ^ "Air Raid Precautions - Deaths and injuries". tiscali.co.uk. Archived from the original on 8 March 2007. ^ "Mobile Firing Operations & Locations". V2Rocket.com. Archived from the original on 13 August 2007. ^ Stephen Henden. "Flying Bombs and Rockets, V2 Woolworths New Cross". flyingbombsandrockets.com. Archived from the original on 14 December 2012. Retrieved 23 March 2011. ^ "V2Rocket.com "Antwerp, The City of Sudden Death"". Archived from the original on 3 July 2015. ^ "V-2s on Remagen; Attacks On The Ludendorff Bridge". V2Rocket.com. Archived from the original on 14 November 2014. Retrieved 14 November 2014. ^ Foster, Vicki. "65th anniversary of the V2 rocket landing in Orpington" Archived 10 September 2016 at the Wayback Machine, News Shopper, Orpington, Kent, 2 April 2010. ^ Robert C. Harding (2012). Space Policy in Developing Countries: The Search for Security and Development on the Final Frontier. Routledge. pp. 34–35. ISBN 9781136257896. Archived from the original on 20 September 2017. ^ Paul I. Casey (2013). APOLLO: A Decade of Achievement. JS Blume. p. 19. ISBN 9780984716302. ^ a b c d e Jeremy Stocker, "Britain and Ballistic Missile Defence, 1942–2002", pp. 20–28. ^ "V2ROCKET.COM - Mittelwerk / DORA". v2rocket.com. Archived from the original on 19 July 2013. ^ Dyson, Freeman (1979). Disturbing the Universe. Harper & Row. p. 108. ISBN 978-0-465-01677-8. ^ Jim Oberg and Dr. Brian R Sullivan (March 1999). "'Space Power Theory". U.S. Air Force Space Command: Government Printing Office. p. 143. Archived from the original on 3 February 2009. Retrieved 28 November 2008. ^ "The 8th of September 1944 AD, First German V2 rocket lands on London". information-britain.co.uk. Archived from the original on 7 December 2009. ^ Irons, Roy. "Hitler's terror weapons: The price of vengeance". ^ "Hitler's Rocket U-boat Program - history of WW2 rocket submarine". Uboataces.com. Archived from the original on 3 April 2010. Retrieved 27 April 2010. ^ "We Want with the West", Time Magazine, 9 December 1946. ^ "Wernher von Braun". Archived from the original on 23 August 2009. Retrieved 4 July 2009. ^ "How a Nazi rocket could have put a Briton in space". BBC. Archived from the original on 14 November 2016. Retrieved 16 November 2016. ^ "Megaroc". BIS. Archived from the original on 30 October 2016. Retrieved 16 November 2016. ^ "V2 Information". X-Factorial.com. Archived from the original on 14 December 2013. Retrieved 14 December 2013. ^ "V-2 Rocket Components". U.S. Army, White Sands Missile Range. 2010. Archived from the original on 2 September 2013. Retrieved 14 December 2013. ^ Beggs, William. "Hermes Program". Archived from the original on 30 September 2011. Retrieved 1 December 2008. ^ "Redstone rocket". centennialofflight.net. Archived from the original on 20 February 2014. Retrieved 27 April 2010. ^ Anatoli I. Kiselev; Alexander A. Medvedev; Valery A. Menshikov (December 2012). Astronautics: Summary and Prospects. Translated by V. Sherbakov; N. Novichkov; A. Nechaev. Springer Science & Business Media. pp. 1–2. ISBN 9783709106488. ^ "Treloar Centre ACT. 7 July 2009". NSW Rocketry Association Inc. Archived from the original on 20 March 2016. Retrieved 12 January 2017. ^ Australia's Nazi rockets: How German V-2 flying bombs made their way Down Under ABC News, 29 September 2017. Retrieved 29 September 2017. ^ "More pictures of V2 recovery operation at Harwich". ITV News. Archived from the original on 1 April 2012. ^ "V-2 with Meillerwagen". Archived 27 September 2015 at the Wayback Machine National Museum of the United States Air Force. Retrieved: 3 January 2017. ^ "V-2 Missile". Archived 4 January 2017 at the Wayback Machine Smithsonian National Air and Space Museum. Retrieved: 3 January 2017. ^ The WSMR exhibit is Mittelwerk rocket #FZ04/20919 captured during Special Mission V-2 and is painted with a yellow and black paint scheme of the first successful V-2 launched at WSMR on 10 May 1946. ^ "V-2 Rocket". Archived 26 September 2015 at the Wayback Machine National Museum of the United States Air Force. Retrieved: 3 January 2017. Oberg, Jim; Sullivan, Dr. Brian R (original draft) (March 1999). "'Space Power Theory". U.S. Air Force Space Command: Government Printing Office. p. 143. Retrieved 28 November 2008. 24,000 fighters could have been produced instead of the inaccurate V-weapons. Harris, Arthur T; Cox, Sebastion (1995). Despatch on War Operations: 23rd February, 1942, to 8th May, 1945. p. xliii. ISBN 0-7146-4692-X. Retrieved 4 July 2008. Look up v-2 rocket in Wiktionary, the free dictionary. Wikimedia Commons has media related to V-2 missiles.